Modern life is totally crazy. No matter how old you are, you're pulled in a dozen directions from the moment you wake up. There are texts from friends, notifications from social media to check. And then there are the real-life people who are requiring your attention. Mom needs your help packing lunches. Dad is drilling you with questions about the day's schedule. And how does your kid sibling seem to be everywhere at once keeping you on edge? Every day you have to balance your education, your friends, and your creative pursuits. Oh, and we haven't even covered your multiple after-school activities. Even without fighting crime, life can be a little overwhelming. Lucky for you, you can be pretty flexible! Looks like the Incredibles got an update! This costume has the Edna Mode touch with this shimmery jumpsuit. It has a short turtleneck, long sleeves with black glove-like sleeves. The high hips are attached to dark legging pants and faux boot tops with elastic bands that slip under the feet so they can be paired with black shoes for a seamless look. 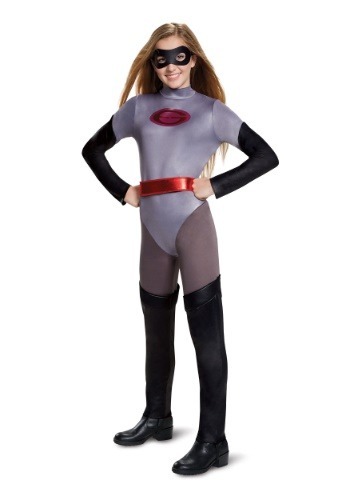 Elastigirl's uniform is finished off with a glossy red belt, the famous logo, and the all-important superhero black mask. Better get stretching, you're going to be Incredible in no time! The great thing about being a part of an incredible family? You get to work together to make the world a better place. Pair up with the quiet yet fierce Violet, the fun-loving Dash, and off-the-hook Jack-Jack. Maybe Mr. Incredible and Frozone will even join you. Maybe you're out there fighting a brand-new villain or maybe Halloween has you on a brand new mission. Going into the night and gathering intel (aka candy) sounds like a mission every member of the family will enjoy!